Kids absolutely love brands and Disney Pixar’s Cars is one of the most iconic of those brands. 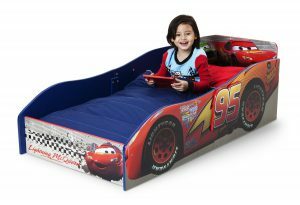 Wouldn’t a bed branded with Cars be an absolutely fantastic addition to your little boy’s bedroom? Thankfully the Delta Children Wood Toddler Bed, Disney/Pixar Cars is the best option for providing just that. The bed borrows branding from the Disney Pixar series Cars and also roughly follows the shape of a car. Most kids are guaranteed to love the movie franchise that this bed is based upon, making it the perfect option if you regularly struggle to get them to sleep. 1. What is this toddler bed all about? As a parent, you’d be forgiven for not understanding the significance of this bed. It generally appears to be a pretty standard bed with car themed branding painted on the side. However, this branding is actually taken from the popular Disney Pixar film series Cars. Cars has been a huge success across the world, spanning a number of branded products. With that in mind, it comes as no surprise to see a Cars themed bed. The bed is actually just a pretty standard wooden themed frame, with Cars themed decals stuck on the side of the bed. Because of this design choice, Delta Children have been able to keep the overall price of the bed pretty low, available for only $80. The authentic decals are focused around the main character in Cars, Lightning McQueen. It’s pretty much guaranteed that your child will instantly recognise this iconic character. The actual bet itself is comprised of a pretty sturdy frame, built with strong materials, designed to last. Much like with all of Delta Children’s products, this bed has been tested to make sure it meets all of the JPMA’s safety requirements. We know you want safe of mind when it comes to your children’s furniture and this product should provide it. At this point, it is worth noting that there’s some assembly required with this product. As with most online order flat pack furniture items, you can expect the product to come in a number of pieces. We’ve found that the assembly process isn’t too bad and shouldn’t actually take you too long, especially in comparison with other similar products. If you’ve taken a look at the aforementioned bed and decided that it’s not for you, we have a few alternative options that might be more up your street. The first of which is another product from Delta Children, again based on the Cars series. However, this bed is a little bit different in what it offers. We particularly love that the actual bed frame itself has been designed with the faces of Cars characters. It’s a little bit more inventive than the painted on decals used by Delta Children’s other option. What’s more, this bed is actually cheaper too. Pretty similar in nature is the Delta Cars Toddler Bed, it’s a bit of a more basic design, but still looks good and generally a product any Cars enthusiast will love. In our final opinion, fans of the Cars film series will absolutely fall in love with this bed from Delta Children or any of the other Cars options that the company offers. Bringing a popular brand into the bedroom might be a great way to help with the process of getting to sleep. We know better than anyone that kids don’t like bedtime, but this bed from Delta Children might just go some way to change that. It’s definitely hard not to recommend the Delta Children Disney Pixar Cars Wood Toddler Bed.